The department is pleased to announce Jacob Tsimerman will be awarded the 2019 Coxeter-James Prize. The media release can be accessed here. The Coxeter-James Prize is awarded annually since 1978 and it recognizes young mathematicians who have made outstanding contributions to mathematical research. Information on past winners can be found here. The Math Outreach Office would like to thank its donors for their recent financial support. The awarded funds will be used in 2019 to support some of our programs geared toward student learning in mathematics from grades 3-12. Click below to access your downloadable copy of the Department of Mathematics Fall 2010 Newsletter. Congratulations to the Mathletes + 15 mod 7 who once again participated in the Toronto Marathon on Sunday, October 17th. The team, consisting of Geordie Richards, Elio Mazzeo, Nataliya Laptyeva, Mitsuru Wilson, Matt Rideout, Bethany Springer, Marco Gualtieri and Artem Dudko, placed third out of 98 teams this year. The plaque and medal are currently on display in the main math office. Our congratulations go to this well deserving team of Mathletes! 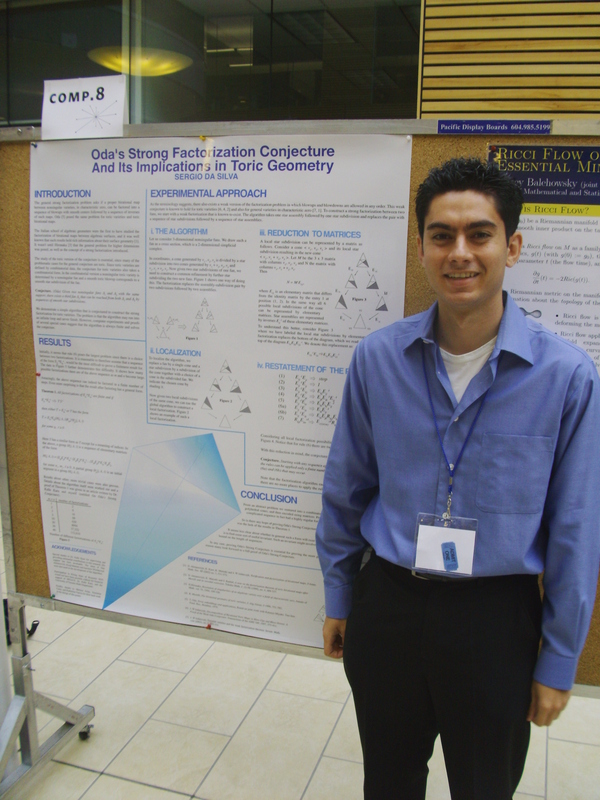 Undergraduate student Sergio DaSilva’s poster entitled “Oda’s Strong Factorization Conjecture and its Implications in Toric Geometry” has won the “Most Outstanding Poster” prize at this years Rising Stars Conference. 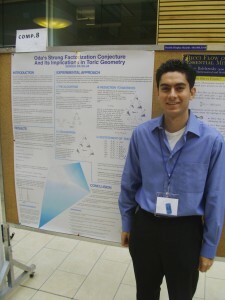 The poster was featured in the computational science section which covers areas such as math and computer science. The poster was marked by four judges on aspects of the poster itself, the student’s presentation and the research covered. Sergio’s subject area is algebraic geometry and deals more specifically with birational geometry. His poster was based on work that he did last summer at UBC with Dr.Kalle Karu through an NSERC USRA. The original results will be published in the Tohoku Mathematical Journal. Congratulations go to Professor Marco Gualtieri. He, along with Xiang Tang, an assistant professor at Washington University in Saint Louis, were awarded this year’s prestigious André Lichnerowicz prize. The prize was awarded at a ceremony on July 26, 2010 at the IMPA in Rio de Janeiro. From the ceremony: ”the André Lichnerowicz prize was established in 2008 to be awarded for notable contributions to Poisson geometry. The prize is to be awarded every two years at the “International Conference on Poisson Geometry in Mathematics and Physics” to researchers who had completed their doctorates at most eight years before the year of the Conference. The prize was named in memory of André Lichnerowicz (1915-1998) whose work was fundamental in establishing Poisson geometry as a branch of mathematics. In 2010, it was awarded by a jury composed of the members of the scientific and advisory committees of the biennial Poisson Conference. Our sincere congratulations go to Professor Gualtieri on this well deserved achievement!